Hardcover, 12 x 9.75 in. / 112 pgs / 26 color / 26 bw. The Arkansas Delta has been called at different times the soul of the South, the land of opportunity, a place ruled by race, a forgotten place. Eugene Richards (born 1944) first went to the delta as a VISTA volunteer in 1969. It was less than a year after the assassination of Dr. Martin Luther King, Jr., a time when cotton, religion, prejudice and poverty were what characterized most peoples' lives. Increasingly drawn to this both sorrowful and beautiful place, Richards would stay for more than four years, working as a social worker and reporter until the community service organization and newspaper he helped found were forced to close their doors. But over the years he would keep returning. Red Ball of a Sun Slipping Down is a book that speaks of remembrance and change, of struggle and privation, of loving and loss, of then and now. Black-and-white photographs made long years ago but never before published are interwoven with recent color photographs and, in turn, with a short story that relates Richards' relationship with an impoverished delta family as well as a growing awareness of his own aging and mortality. 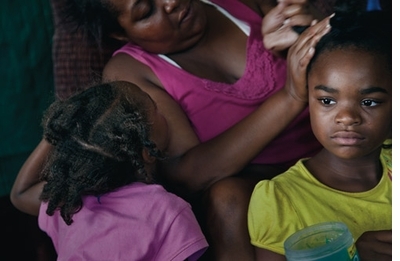 Featured image, "Sandra and Porter Lee, Hughes, AR" (2010) is reproduced from Eugene Richards: Red Ball of a Sun Slipping Down. This volume, funded by a Kickstarter campaign, artfully blends older black-and-white and recent color images. These are woven together with a short story about rememberance and change, Richard's relationship with the family, and his awareness of his own aging and mortality. Eugene Richards' book full of unpublished black and white photos and recent color work is a visual reminiscence of the Arkansas Delta, a region he first entered in 1969, and would continually return to. When Eugene Richards went to the Arkansas Delta in 1969 as a VISTA volunteer, the region was still roiled by the civil-rights movement. He stayed for four years, and many of the pictures in “Red Ball of a Sun Slipping Down” date from that period. Mr. Richards went back later to see people he had grown attached to, and the pictures he took on these visits are interspersed with the earlier ones; the effect is reminiscent of the way all our memories of a place or person we have known for a long time get jumbled in our minds. He has always located beauty in the midst of the suffering, not as a means of papering anything over but as a justification for living. 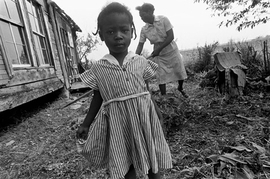 He first began taking pictures as a Vista volunteer in the Arkansas Delta from 1969, and in red Ball of a Sun Slipping Down - which was funded through a Kickstarter campaign - he revisits the cotton fields and sharecropers' dwellings and contrasts the black-and-white photos from then with the color shots now. Trailers have replaced wooden shacks, and the gun-toting straw bosses may no longer be in evidence, but generally things do not seem to have changed much at all, and indeed you may find yourself flipping back to certain pictures to ascertain whether they date from this decade or 40 years ago. This self-published book brings together Eugene Richards' work from the Arkansas Delta since the days he first went as there a Vista volunteer in 1969. Some of the work appeared in his first book, Few Comforts or Surprises, published in 1972. It's a mix of classic documentary reportage of the '60s and '70s; the forceful, wide-angle work for which Richards became known in the '80s; and his recent, sublime color work. A single line of text on each page opposite the photographs strings the whole thing together. It's very lyrical, in a way you may not expect if the last Eugene Richards book you looked at was Cocaine True Cocaine Blue or even Walking Through the Ashes. 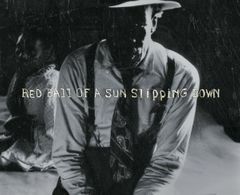 Far more than a collection of Richards' work in the Delta, Red Ball of a Sun Slipping Down is about his fulfillment of a promise made to a woman he met long ago—and to himself. FORMAT: Hbk, 12 x 9.75 in. / 112 pgs / 26 color / 26 b&w. Published by Many Voices Press.